Needs a bit of basing this fellow. Quickly painted up 40 of the Warzone plastic Imperials last weekend. Painted up for a game of Space Fag at the club. I won. Does that make me a loser, also? Various Vallejo browns in use (top tip: don't bother if using dip as final coat before dullcoating). Snakebite Leather on the trim of the knees. Privateer Press Bloodstone on the bolt-gun knock off. Russian uniform green on the other. 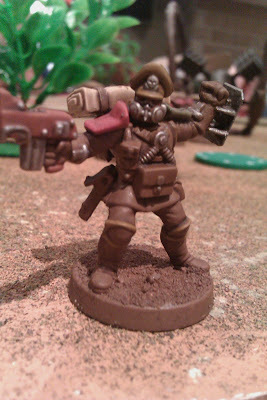 Army Painter strong tone (middle strength) over the top.